Operators: Maksimov L., Fedyaev E.
About the visit of the Syrian parliamentarians to the USSR. 1h. - Visit of the delegation of the National Council of the Syrian Arab Republic in the USSR (August 1983).. Staying in Moscow. Official events. 2h. - Visiting Tallinn sightseeing. Returning to Moscow, the completion of the visit. Moscow, passers-by on the street, the Moskva River embankment. Monument VI Lenin in the Kremlin. The building of the Supreme Soviet of the USSR. The head of the Syrian delegation, member of the leadership of the Arab Socialist Baath, chairman of the People's Council of Syria Mahmoud Zuabi accompanied by officials included in the building of the Supreme Soviet of the USSR, among welcomes guests to the chairman of the Council of Nationalities of the Supreme Soviet of the USSR VP Ruben. VP Ruben and M. Zuabi at the negotiating table are talking. In conversation involved: deputy of the Supreme Soviet of the USSR UNC, Syrian Ambassador to the USSR Muhammad Ali Halyabi, Mohsen Bilal, Ghassan Rajab, Oda Cassis and other officials. Speeches VP Ruben and M. Zuabi. Parliamentarians visit Syria cabinet VI Lenin in the Kremlin. Mausoleum VI Lenin on Red Square. Syrian parliamentarians laying a wreath at the Mausoleum. Tomb of the Unknown Soldier near the Kremlin wall. Syrian parliamentarians laying a wreath at the tomb. Chairman of the Presidium of the Union of Soviet Societies for Friendship ZM Kruglov headed representation of the friendship society "USSR - Syria" met with parliamentarians Syria headed by M. Zuabi in the Moscow House of Friendship. House of Friendship on Kalinin Avenue. The building of the Moscow City Council. First Deputy Chairman of the Executive Committee of the Moscow Soviet SM Kolomin receives a delegation of Syria headed by M. Zuabi. The central entrance Exhibition Center, Fountain "Friendship of Peoples." 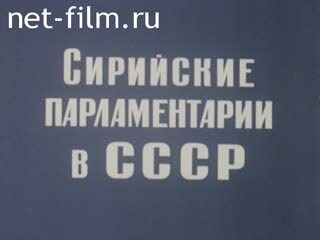 The facade of the pavilion "Electrification of the USSR." Syrian parliamentarians acquainted with the exposition pavilion: working models of thermal power plants and hydro power plants, the layout gidroplotiny. Parliamentarians Syria laying flowers at the monument to Yuri Gagarin. In the Cosmonaut Training Center acquaint visitors with the spacecraft - the details of the ship, the remote control. Accompanies guests, Soviet cosmonaut, Hero of the Soviet Union LS Demin. Estonian SSR: reportage board of Tallinn. The building of the Supreme Council of Estonia. Chairman of the Presidium of the Supreme Soviet of the Estonian head of delegation takes Ruutel M. Zuabi Syria and accompanying officials talk at the negotiating table. Members of the delegation visited Syria Tallinn knitted Production Association "Marat". Powered spinning machine, spinning reels with yarn. Tallinn from the observation deck. The old part of the city. Chairman of Tallinn City Council Norac, in Town Hall, meets with members of the Syrian delegation, the participants at the negotiating table. Residents farm "Edasi" Pärnu district greet the head of the Syrian delegation M. Zuabi and his entourage. View of the village with modern buildings. Orchestra playing in the street. Syrian parliamentarians visiting the exhibits in the museum hall of Tallinn arts and crafts: panels, vases, figurines of musicians, etc . ; visit the Port of Tallinn. Soviet-Syrian meeting in the Kremlin with members of the Syrian delegation headed by M. Zuabi - VP Ruben; GA Aliyev, talk at the negotiating table. M. Zuabi gives an interview in the hall of the Kremlin. The building of the airport "Sheremetyevo". Flags of the USSR and Syria. VP Ruben and other officials say goodbye to parliamentarians Syria.